Take a look at my finished mani below! Look at this cutie! Ahh! So let's break down all the polishes I used to put this together. 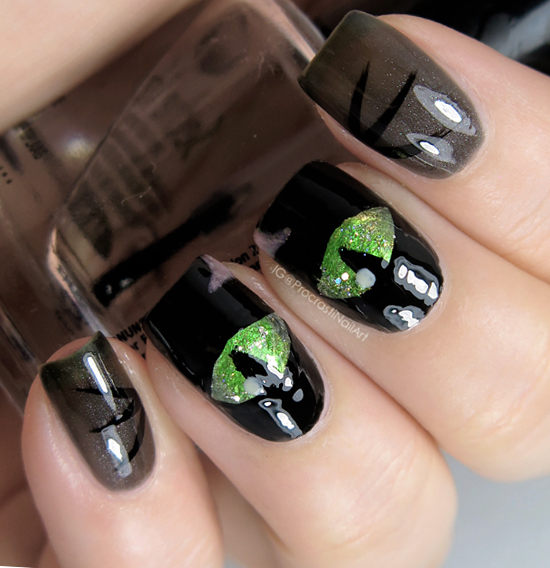 I started out by tracing the eyes out with Sinful Colors Black on Black and then painted them in with shades of green - OPI Skull & Glossbones for a base with OPI Just Spotted the Lizard and OPI My Gecko Does Tricks on top. I finished them with a bit of loose holo glitter and added the eye details, made a tiny noise with Fair Maiden Little Miss Valentine and sealed it all with glossy top coat. For my other two fingers I knew I wanted to do some whiskers to finish the look so I put down a base with three coats of Sally Hansen Big Smoky Top Coat and then drew on whiskers with Sinful Colors Black on Black. Kitty-tacular! So friggen cute, I love these nails. So what about you: cat person? Or dog person? :) Or neither! Or BOTH! Your cat eyes are really good! Hot dang that is one glossy mani! Mine are never that glossy! And I adore the smoky nails! Aww these are perfect! The way you did the green eyes is perfect! Oh my, how cute! I love the sparkly eyes! I love these as well! I have three cats and one of two of them are actually black lol. very spooky. All my black cats had yellow eyes. Okay, these are THA BOMB! Dog person, but I've had some great cats. These are unexpected and fun I love them.